The completely re-engineered iMac Pro is Apple's fastest and most powerful product ever. Today's the day Mac enthusiasts have been waiting for: Apple has released its fastest and most powerful product ever – the iMac Pro. Re-engineered from the ground up, the iMac Pro boasts a staggering spec list, packing workstation-class parts into its iconic iMac all-in-one design. First announced at Apple's Worldwide Developer Conference back in June 2017, this iMac Pro has been a long time coming. As we saw yesterday in T3's interview with Phil Schiller, Apple has been focusing on making sure the release is perfect. With a price tag starting at $4,999/ £4,899, we're expecting great things. Keep in mind that this hefty price bags you the most basic iMac Pro, which comes with an 8-core Intel Xeon processor, 32GB of RAM and 1TB of storage. If you've got the budget to scale things up, you can grab the top-spec iMac Pro for £12,279. For your money you'll get a whopping 18-core Intel Xeon processor, 128GB of RAM and 4TB of SSD storage. One of the biggest lures for designers though will be the Xeon processors. Thanks to their sturdy and reliable nature, Xeon chips have the benefit of providing larger caches, meaning that designers working with large Photoshop files will experience a superior performance. Backed up with error-correcting code RAM, creatives will also be able to put the iMac Pro through its paces without having to worry about errors that could result in a loss of data. A new thermal design is also integrated into the build, allowing the iMac Pro to increase its cooling capacity by 80%. No need to worry about overheating when you're waiting for a monstrous render to complete. Amazingly, Apple has delivered this beefed up device in a slim-line monitor with the same 27-inch display used on previous standard Mac desktops. The main visible difference will be that the exterior of the iMac Pro will be decked out in the same Space Gray colour used across Apple's iPads and MacBook Pros. When it comes to making art, designers will be able to see their work on screens with the 5K resolution they're familiar with using on existing Macs. 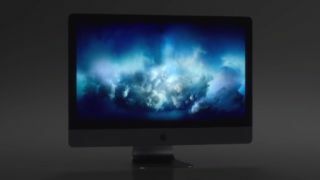 However the iMac Pro screens are also 43% brighter and deliver an output of up to one billion colours. On top of this, the iMac Pro looks set to be a useful platform for VFX artists when it comes to creating content for VR platforms. This is down to Oculus and HTC both now supporting Macs on their headsets. If there's one complaint we've seen with the iMac Pro (apart from some baulking at the cost) it's that there's no Touch Bar integration. But if this is at the cost of the station's formidable power, we think it's a fair trade off.